April 18, 2014 – Distillers have long been known for collaborating with each other on techniques, recipes, and even supplying spare parts or still time when needed. 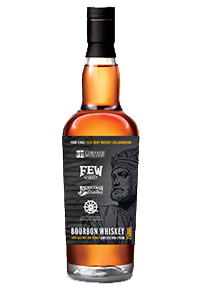 Rarely, though, do they join forces to blend their whiskies together…with the exception of special charity bottlings such as last year’s Master Distillers’ Unity Bourbon to raise money for the ALS Association’s “Parker Beam’s Promise of Hope Fund.” Now, four Midwestern craft distillers have joined forces to create the limited-edition “Four Kings Bourbon” that will go on sale in Chicago next week. “Like many things in this business, it happened over a glass of whiskey,” Ryan Burchett of Iowa-based Mississippi River Distilling Company said. Burchett had been on a craft distilling panel with Bill Welter of Michigan’s Journeyman Distillery and Paul Hletko of Few Spirits during WhiskyFest Chicago last year, and were sitting at a bar with Andrew Webber of Corsair Artisan Distillery. “We talked about our different whiskies and talked about craft, and each distillery poured a sample. I said ‘boy, that would have been cool if we would have, like, had a blend or something and we could have poured that’ and we got to talking and said “we should do that for next year.” Their initial enthusiasm was tempered by the realization that each distiller had a different distributor, and getting the four distributors to cooperate could be difficult. Enter Brett Pontoni, whisky specialist for the Chicago-based Binny’s Beverage Depot chain. Pontoni helped solve the distribution problem by offering to take the entire production run. “I thought it was cool as hell that these guys wanted to get together and do this,” Pontoni told WhiskyCast’s Mark Gillespie in a telephone interview. “My only involvement was saying ‘guys, I can’t believe that this is gonna be anything but great, and I’m more than happy to guarantee that if necessary, I’ll take everything just to make sure the project launches and nobody’s hung with anything.” With that, the distributors agreed to work together, seeing the potential to help raise the profile of all four distilleries. With that issue solved, the distillers went to work. Each distillery contributed 30 gallons of Bourbon, with Burchett, Welter, and Hletko using their standard Bourbon mashbills. “Our friends at Corsair in Nashville, they’re the experts on doing funky stuff,” Burchett said. “They threw in some bourbon that had some experimental grains in it, some smoke and things like that, and that gives it a unique finish too.” Corsair sent 15 gallons of its regular Bourbon and 15 gallons of Bourbon made with smoked wheat, which makes the final blend a four-grain Bourbon with corn, rye, wheat, and malted barley. 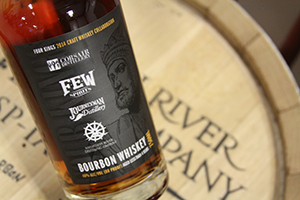 Burchett blended the whiskey at his distillery on the banks of the Mississippi River in Le Claire, Iowa, and his marketing agency came up with the “Four Kings” name and label incorporating the logos of all four distillers. The final blend produced around 700 bottles, of which 600 will go on sale April 24 exclusively through Binny’s starting that night with the annual Binny’s World of Whiskies festival. There will also be a tasting party with the distillers that night at Delilah’s, which will be one of the four bars to carry Four Kings along with Fountainhead, Clark Street Ale House, and The Bar on Buena. Editor’s note: This story was updated with additional information following an interview with Brett Pontoni.